So much of the excitement for Trek's 50th anniversary is centered on celebrating all that has brought us to this point. But how are things looking going forward? This week hosts Cam Smith and Tyler Orton, along with returning guest Andy Chan, hold their annual forum to candidly discuss the franchise's current status quo. How does the Fuller-produced 2017 series appear to be shaping up? Will Star Trek Beyond be able to overcome its bizarre total lack of buzz and be the hit film we hope it will be? And, with lawsuits toppling major efforts like Axanar, what is the future for fan film makers? Just like last year there's no shortage of food for thought, so join us in digging right in! Wanna appear on the show? Shoot us a 30 to 60-second audio clip letting us know how healthy you think THE CURRENT STATE OF TREK is and you could take the spotlight in an upcoming program! 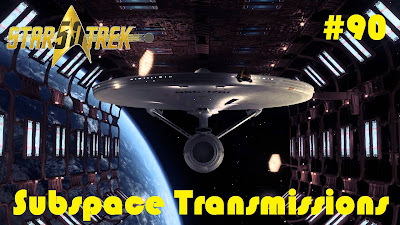 You can also send any other questions, topic ideas or feedback to subspacetransmissionspod@gmail.com! Join us next week for "Chaos on the Bridge!" #91 - EARLY TNG: WHAT WENT WRONG? #89 - PITCH YOUR OWN STAR TREK ANTHOLOGY!